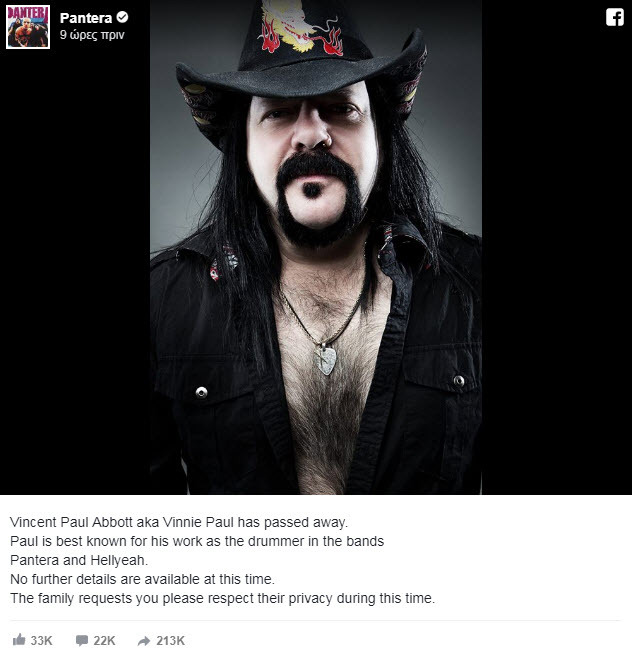 The drummer’s passing was confirmed on both his personal and PANTERA‘s Facebook pages, where an identical announcement appeared Friday night. Since his brother’s murder, Vinnie Paul released several Dimebag-related items through his Big Vin Records label, including DVDs and the paperback book “He Came to Rock”. Vinnielater said that the Dimebag-related releases weren’t an attempt to cash in on his brother’s tragic end but rather a way to keep Dimebag‘s legacy alive and well. Vinnie and Anselmo‘s relationship got more acrimonious when Vinnie indirectly blamed Philipfor Dimebag‘s death, suggesting that some remarks the vocalist had made about Dimebag in print just weeks earlier might have incited Dimebag‘s killer. For the past decade, Vinnie has been touring and recording with HELLYEAH, whose fifth album, “Unden!able”, came out in 2016. Shortly before his death, Vinnie laid down the drum tracks for HELLYEAH‘s sixth album at The Hideout recording studio in Las Vegas.